Members of the University of Manitoba Faculty Association (UMFA) have returned a strong strike mandate to their bargaining team as the union continues negotiations with the U of M toward a new collective agreement. In what the union is calling a historically high level of support, 86 per cent of members who voted over three days last week supported giving the union authority to strike. 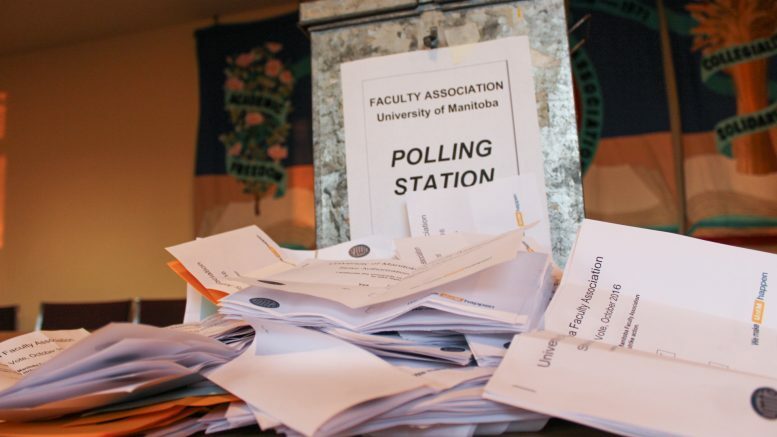 Nearly two-thirds of the roughly 1,200 faculty, researchers, and librarians represented by UMFA cast ballots. In the last 15 years, UMFA membership has not returned a strike vote with more than 76 per cent support. “This was actually stronger than we had even anticipated,” said Mark Hudson, UMFA president, adding that negotiations are ongoing and the association intends to give bargaining every opportunity to succeed. “I think it’s a pretty powerful reaffirmation of the bargaining priorities,” he said. The vote comes after the university published details of a four-year offer in September. The offer included a seven per cent salary increase over the four years. Including existing annual increases and proposed competitive salary bumps to address specific areas of need, the average UMFA member’s salary increase would be closer to 17.5 per cent over the contract’s term. Hudson said the university proposal fell short of meeting the association’s concerns surrounding work and teaching loads, collegial governance, and teaching assessments. UMFA has countered the university offer with a one-year proposal that includes an average salary increase of 6.9 per cent, which would bring U of M faculty members more in line with comparable Canadian research universities, branded the U15. U of M faculty members are currently among the bottom of the U15 for compensation. Danakas noted the administration proposed a less confrontational, interest-based bargaining model in the winter; forwarded a one-year, salary-only offer that included a 1.5 per cent increase in the spring; and presented the union with the four-year deal with terms similar to those recently accepted by University of Winnipeg faculty all in an effort to reach an agreement without disrupting classes. All proposals were rejected by the union or returned with amendments. “We very much understand the anxiety around the uncertainty that labour action brings,” Danakas said. In July, the University of Winnipeg Faculty Association ratified a 4.5-year deal that includes a 7.5 per cent salary increase over the contract’s term. The University of Winnipeg is not a member of the U15. Hudson said UMFA is wary of signing on to a long-term, four-year agreement at a time when the university is preparing to undergo potentially major transformations, including the exploration of a more decentralized budget model. “Bargaining really is our opportunity to have our voices effectively heard,” he said, adding that the association does not consider a strike lightly. The most recent three-year contract between UMFA and the university expired March 31. Some U of M students are rallying behind UMFA, including the U of M Student Action Network, which began circulating a petition last week and quickly collected more than 400 signatures. A Students Supporting UMFA Facebook group has also emerged online with nearly 300 followers. Ian McDonald, a member of the Student Action Network who has been canvassing for signatures, said he supports the faculty’s push to protect quality education and academic freedom but noted there is also a concern about getting more voices at the university’s decision-making table. “We need to work towards a university where students and workers are collectively making decisions, and it’s not up to just a few people, such as those in the administration, to decide how things are run, whether that’s in the case of teaching loads, tenure criteria, or whatever,” he said in an email. McDonald lauded the faculty and students who are standing up to an administration he accused of promoting style over policy. “This also speaks to our university’s general direction where we get more flash and less substance, more advertisements and less professors, more construction projects and less courses offered, more administrative consultations and less decision-making power,” he said. He said students have a responsibility to support UMFA’s push for controls on class size and maintaining academic freedom, which directly impacts students. Tanjit Nagra, president of the University of Manitoba Students’ Union, briefly addressed the dispute at last week’s regular council meeting, saying she remains neutral in discussions and her biggest concern is assessing the impact a strike would have on students. The UMSU executive issued a release last week expressing disappointment an agreement has not been reached. “Throughout these labour negotiations, it is vital that both sides remember that the students are the largest stakeholders during this entire process,” the release stated. While U of M faculty have not taken to the picket line since 2001, McDonald acknowledged the idea of a strike is concerning for students but said the ends can justify the means. “Strikes can be worrying but I think students are aware of why it is coming to this,” he said.